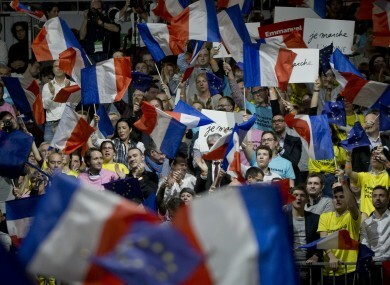 Supporters of Presidential candidate Emmanuel Macron at a rally in Lyon. SUSPECTED RUSSIAN CYBERATTACKS on the French presidential campaign are “unacceptable”, according to France’s foreign minister, adding it was clear that pro-Europe candidate Emmanuel Macron was being targeted. “It’s enough to see which candidates, Marine Le Pen or Francois Fillon, Russia expresses preference for in the French electoral campaign,” Foreign Minister Jean-Marc Ayrault said in an interview with Journal du Dimanche. Whereas Emmanuel Macron, who is pro-Europe, is being targeted by cyberattacks. This form of interference in French democratic life is unacceptable and I denounce it. “Russia is the first to say that non-interference in domestic affairs is a cardinal rule and I understand that. Well, France won’t accept its choices being dictated to it either,” he added. France warned Russia on Wednesday against meddling in the elections, after a spokesman for Macron — the 39-year-old centrist former economy minister — pointed the finger of blame at Moscow. The allegations come in the midst of a furore over Russia’s alleged interference in the US electoral campaign that has forced out one of President Donald Trump’s top aides. US intelligence agencies had already accused Russian intelligence of hacking Democratic Party emails that embarrassed Trump’s rival Hillary Clinton. After what happened in the United States, it is our responsibility to take all steps necessary to ensure that the integrity of our democratic process is fully respected. Email “Russia accused of cyberattacks in another election - This time in France”. Feedback on “Russia accused of cyberattacks in another election - This time in France”.